Shooting glasses with your prescription or without are available in Beverly and North Andover ONLY. In the late 1970′s Randolph Engineering started manufacturing Aviator sunglasses for the United States Air Force. By the late 1980′s Randolph had expanded into the commercial sunglass market after civilians learned about the quality of its sunglasses and prescription frames. Randolph Engineering products are famous for their quality and durability. Each pair of sunglasses goes through more than 200 production stages – mostly by hand. The company even makes their own solder flux. As a result, their frames provide unequaled strength and solder joint integrity. In their drive for superior quality, they scour the world for the best components and special alloys with tight molecular structure to eliminate rusting and oxidation. Randolph Engineering does not compromise quality, even when selecting something as minute as a lens screw. Their nose pads are made of soft silicone to prevent the frames from slipping, even during heavy perspiration. While fashion may fade in and out of the marketplace, the quality found in Randolph Engineering products will never go out of style. The Ranger set the standard for safety, comfort, and target enhancement. Its lightweight, high-tech alloy frame with dual-action spring temples, is made for all day comfort and maximum durability. With your prescription or without the adjustable nose pad arms allow for a custom fit. The offset nose pads prevent fogging and cable temples hold your frame firmly in place. The Ranger is available with interchangeable lenses which allow for accurate targeting under differing light conditions. All lenses filter harmful and distracting ultra violet light. This is serious style for serious shooters. Designed from the ground up by our team of experienced optical engineers, the XLW is the industry’s first wrap around frame specifically made for sport shooting. While some wrap eyewear may distort your vision, XLW lenses are always 100% distortion free. A custom design prescription insert allows clear vision in your prescription. Adjustable nose pad arms allow for a custom and secure fit. The nose pads are offset to prevent fogging. The XLW is available with interchangeable lenses, which enhance targets under differing light conditions. All lenses filter harmful and distracting ultra violet light. Designed with the advice the shooting industry’s top opticians, the Edge combines a sleek design with professional optical performance. The upswept lens shape allows the frame to fit close to your face, maximizing your peripheral field of view. This frame features angular lenses to prevent fogging. It is available with your prescription or without. The adjustable nose pad arms allow for a comfortable fit. The Edge is available with interchangeable lenses which allow for accurate targeting under differing light conditions. All lenses filter harmful and distracting ultra violet light. Designed to accommodate nearly any prescription, the Sporter Rx features a full frame with optional clip-ons. This rugged yet practical frame is excellent for shooting and other outdoor sports or as an everyday pair of prescription glasses. As with prescription eyewear the adjustable nose pad arms allow for a custom fit. The nose pads are offset nose to prevent fogging and cable temples hold your frame firmly in place. The Sporter will accommodate almost any prescription. It is available with a separate clip-on that holds our proprietary target enhancement lenses. All lenses filter harmful and distracting ultra violet light. The Sporter Clip is built with the same craftsmanship as our full frames. It is designed to fit precisely over the Sporter prescription frame and is available in all lens tints. The Sporter Clip can be purchased separately for use over your prescription eyewear. From any shooting discipline to fishing and hunting, quality lenses will not only protect your eyes from hazards, they’ll actually elevate your performance and prevent eye fatique. Those who are serious about the quality of their vision depend on Ranger lenses to perform, no matter the goal. All Ranger lenses absorb 100% of UV rays and are molded at above industry standard thickness for your protection. The best advantages to wearing our lenses are enhanced definition and optical clarity. Unlike other shooting lenses, Rangers are made with distortion-free optical-grade polycarbonate. 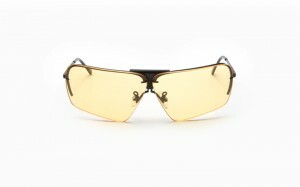 This gives you the level of protection you need, while not compromising the quality of your vision. NexPC is 5-6 times more impact resistant than standard polycarbonate with the same professional grade optics. Intrinsic material properties flex to absorb the force of projectiles before they reach your eye. During everyday use, they remain 100% distortion free and scratch resistant. Pale Yellow – Brightens and contrasts colors in low light conditions. An excellent lens for hunting or target shooting at dusk, dawn, or evening under lights. Medium Yellow – Highlights orange clay targets and enhances contrast in low light or overcast conditions. This is the most versatile yellow tint. Orange – Excellent all around lens for orange clay targets. Blocks haze and blue light and enhances the orange of the target. Light Purple – Provides excellent contrast of orange targets against green backgrounds or blue sky. It dampens the green and enhances the orange target against trees. Dark Purple – A great lens for very bright conditions. Provides contrast of orange targets against a deep blue sky. An excellent lens for glare reduction and snow. Vermilion – A terrific lens for shooting against green backgrounds. Works well for those with red-green color deficiency. Highlights orange and dampens green. Brown – A light reducing lens for bright glare days against an open background. Great for picking up brown hues when hunting game birds. HD – Offers incredibly crisp, clear vision by incorporating precise technology that filters out blue light to increase target contrast. An excellent choice for medium -light conditions. HD Light – Provides a clear and crisp target view while filtering haze in dim light conditions. Copper Polarized- This lens blocks undesirable blue light while improving contrast in other colors. Excellent for shooting targets against a green background on a bright day. Also great for sight fishing. ColorMagTM – Intensifies orange targets against any background. See up to 250% more orange light than a standard lens without affecting other colors. When a split second counts, ColorMagTM gives you every possible edge. Whether you’re piloting an F18 fighter jet or driving a car, you need the best lenses available to protect your eyes and enhance your vision. All Randolph Engineering lenses absorb 98-100% of harmful ultraviolet rays and allow a range of 12-18% of visible light to pass through; the ideal comfort level for most wearers.